Tarot for Change: "Bad" cards in tarot - are negative outcomes really negative? "Bad" cards in tarot - are negative outcomes really negative? Planning a life change? It's natural to want to know whether the change will be a success. But, what if you get a negative card for an outcome? What's the point in trying then? Isn't it easier just to give up and save yourself from the hassle? The short answer is no. There are very few situations, if any, where a card is "bad" or negative. 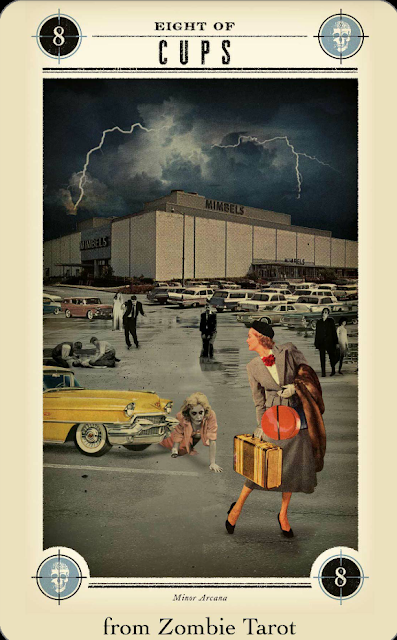 Sure, some cards symbolise strong negative feelings and will feel like an electric shock when the event pictured in the card happens. But is that a bad thing - in the grand scheme of things? What I'm NOT saying is that failures and disappointments don't matter. I actually hate the phrase "is X really that bad in the scale of a hundred years?" Well, just because something is not the literal end of the world, doesn't mean it's not devastating. What I do mean is: there can't be a positive without negative, success without failure, light without dark. It's all about balance and perspective. 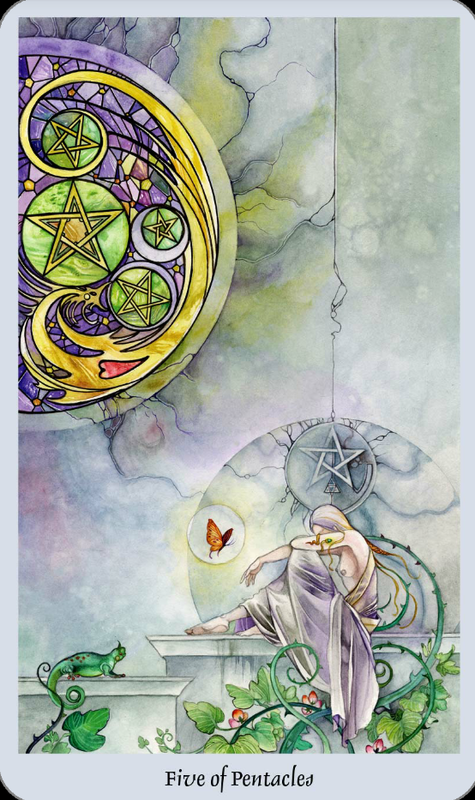 Different decks approach this from dozens of angles.The illustrations vary deck by deck and can frame the meaning in a very different, eye-opening way. Here's a look on the "bad" cards of tarot; the cards that have a bad rap due to the emotional devastation or distress they reflect. 5 Cups. This card in the Rider Waite Smith (RWS) deck shows a cloaked person looking at three chalices that have tipped over. There are two chalices behind the figure but s/he is too absorbed in the grief of loss to notice what's left. The message is "disappointment". Something was lost or not achieved, despite all the effort. I actually got this card for "is this blog a good idea? ", and naturally was disheartened: what's the point of setting it up if there's only disappointment on the way? However, this card is a road bump, not the end of the journey. Yes, not everything will work out as planned and something will let me down. But some parts will work out, if I change my perspective. The eye-opener 5 Cups card for me came from the Victorian Fairy tarot deck. 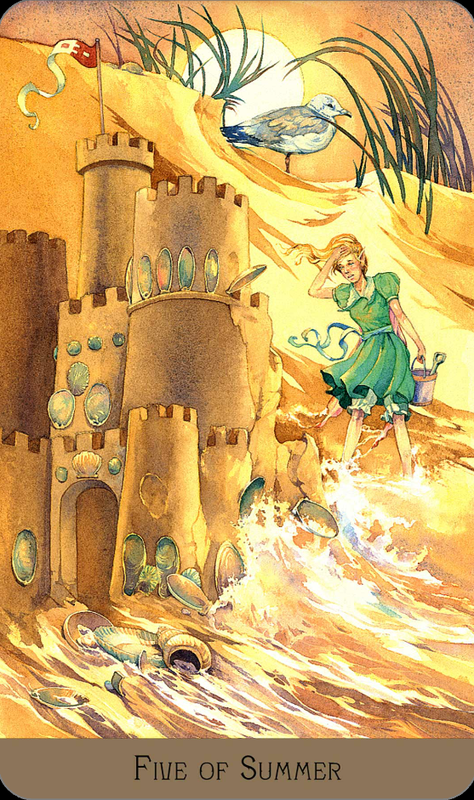 A young female fairy watches her sandcastle being washed away by a wave. She's been working on that castle for the whole day, just to see it crumble at the end. Her creative efforts go to waste, there's nothing tangible left. Is tangible the only thing that matters? She had a great day filled with joy, sun, play and happiness. She learned new skills, got to express herself, built a happy memory alongside that sandcastle. Some of our efforts have to crumble to make way for new ideas, plans, paths and people. Destruction and creation work hand in hand. Victorian Fairy Tarot, Five of Summer (5 Cups). 8 Cups. This must be on everyone's unwanted cards list. The traditional meaning is turning away from something: the emotional investment proved not to be what was hoped for. It's a notch more serious than 5 Cups, which is a temporary disappointment with silver lining. 8 Cups is a full-blown abandonment, walking away from a situation or a relationship. The a-ha! 8 Cups card for me came from the Zombie tarot. A well-dressed housewife rushes out of her favourite shopping mall because there are zombies crawling all over the parking lot. What used to bring pleasure, is now full of bad memories - it's turned haunted and is not the same it used to be. The only reasonable action is to walk away, find another place/thought/action/person to invest in. Even though 8 Cups can denote leaving a job, partner, home; or a need for a more spiritual outlook in life, it can quite practically mean "your decision regarding this question is NO because it's the most sensible course of action." 5 Pentacles. The card of financial hardship, health problems, insecurities and being without is surely on the most hated cards top 5. The traditional RWS card has a pair of miserable young people wandering through snow, but it contains a promise of something better. This card is the only one of the Pentacles suit in RWS that doesn't show actual pentacles, besides the painting in the stain glass window: yes, material security has shaken and life feels scarce, but the pentacles (security, money, health) exist as an idea and an opportunity. The pair can find the door to enter the warmth and shelter. The eye-opener 5 Pents for me is the Shadowscapes version. A young woman is desperately weeping in the shadow of a big stone building (a church or temple?). A vivid orange butterfly is approaching the crying girl from the direction of a beautiful stained glass window. Above the girl's head is a stone carving: a pentacle. It's a reminder that in every situation, the seeds for something better exist. The girl just needs to calm down and see the approaching idea or opportunity (the butterfly). There's no shame in asking for help (the spiritual or religious society depicted by the temple) and she still has the most important element she needs in life: her own self (the Ace above the girl's head pointing to the material world). Life goes on as long as there is breath left in the body, and a new dawn is always possible. Don't give up. Death. This is a scary card and probably one of the reasons why tarot still has a witchcrafty reputation. Everyone's more or less scared of dying, the great transition to the unknown. However, as all tarot readers know, Death hardly ever means physical death. It's the end of something for sure: outdated beliefs, values, thinking patterns, emotions or a mindset. Death card points to a painful transition of letting go of something familiar and secure. But letting go, moving on, is essential for growth: for the new fresh saplings to shoot. 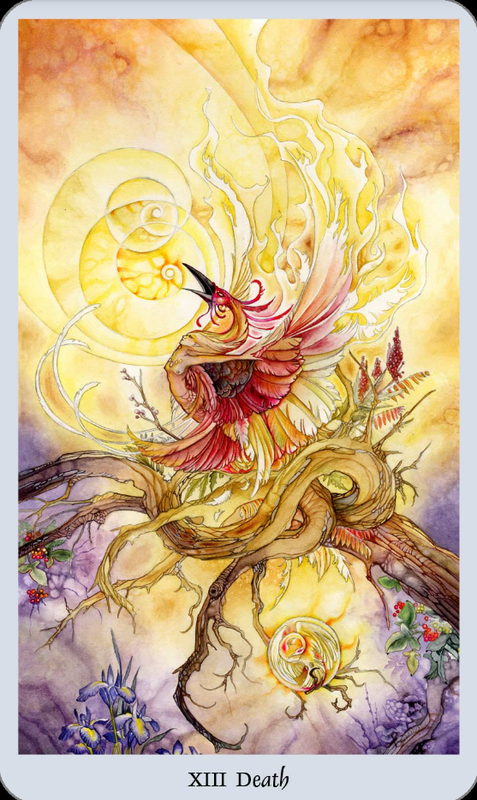 The eye-opener Death card, again, comes from the Shadowscapes deck: a bright, beautiful phoenix. The mythical phoenix sets itself on fire and burns to ashes - to emerge as a refreshed, young, vibrant, energetic new creature to start a new life phase. Burning alive must hurt like heck, yet the phoenix does it to renew itself. Death is walking through fire to destroy the clutter and debris of the old. Tower. This is possibly the most dramatic and least wanted life change card - or a card for any situation. Tower is a sudden destruction, shock to the system, dismantling of the old: be it beliefs, values, hopes or something physical, like health, financial security or a relationship. With tarot's prior warning, unexpected becomes less unexpected. Tower gives time to prepare and feel less shaken when the unexpected hits. The tricky bit with Tower is that it's difficult to assign which area in life it relates to, and that usually causes (unnecessary) anxiety, worrying and fears. Tower comes with two meanings: some things in life just happen, whether we want it or not. The only thing we can control is our own response and attitude. The other meaning is: if something's been built on a unstable ground and has become shaky through years (think a house of cards), it won't last. It's bound to crumble to reveal the weaknesses in your plan / life / attitude. The bull's eye Tower meaning for me is the Victorian Fairy tarot version, the Burning Oak. 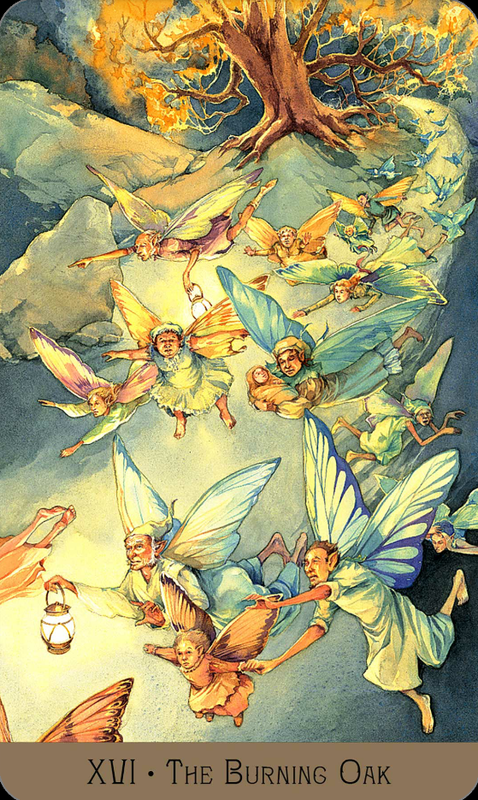 A community of fairies flees to the night - their home tree is on fire. It perfectly captures the Tower feeling: need to evacuate from the situation, panic, frantic action, disbelief, fear, feeling of being out of one's depth and home turf, losing something solid and trusted for good. Tower, Victorian Fairy Tarot (Burning Oak). How could this possibly be a good thing in any situation? The Tower moment, the feeling of ground disappearing under one's feet, is hardly ever welcome. But what follows afterwards is what matters. Destruction - - - reconstruction. Tower only reveals a weakness in a person's mental and emotional constructions. A personal example: I got married for life with someone I met in my early 20's. In a decade, it became clear we were growing to the opposite directions: our personalities, values and beliefs drifted to the opposite ends of the spectrum. It was hard to realise but eventually it hit that even though I cared about him deeply, I merely tolerated our life together. The Tower crumbled, we divorced. The whole Tower year an ongoing divorce was a nightmare, but now I see it set me free. The slate was wiped clean, my life took a turn that led to happiness, satisfaction and feeling complete. So Tower as the outcome might be exactly what the doctor ordered, even though the positives might only be revealed years later. Life is a journey, not a speed lane to perfection. This list lacks "negative" cards such as Devil = obsessions, negativity; 3 Swords = heartbreak and 10 Swords = sudden end of a situation/thoughts/feelings, they will be discussed in the future!